Homepage SEO is important for all websites. Whether you have a blog, corporate website or ecommerce store, you need to SEO your homepage even if this is not one of the pages you expect to get high rankings. Why you should SEO optimize your homepage? There are many reasons as to why you should pay attention to your website’s home page. In many cases it is the first page users see (especially for corporate websites) and it is one of the pages’ users will visit, even if they land on any other pages of your website. They will visit your homepage to find out more about your blog or business. SEO wise it is very important since it is a perfect opportunity to give Google a big hint (through your title, description and content), on what the website is all about. Google will use this information to create your website’s entry in the SERPS when people search for your domain name. Your search snippet needs to be accurate, appealing and professional. In some cases, the homepage is also a candidate to rank in the top positions for highly competitive keywords because it ‘absorbs’ all the power and page rank from the rest of the pages. Contentmarketinginstitute.com homepage ranks for ‘content marketing’ because the website has a plethora of articles related to content marketing. socialmediatoday.com homepage ranks for ‘social media’ since it has a lot of content related to social media marketing. The process of optimizing your homepage involves a number of steps. 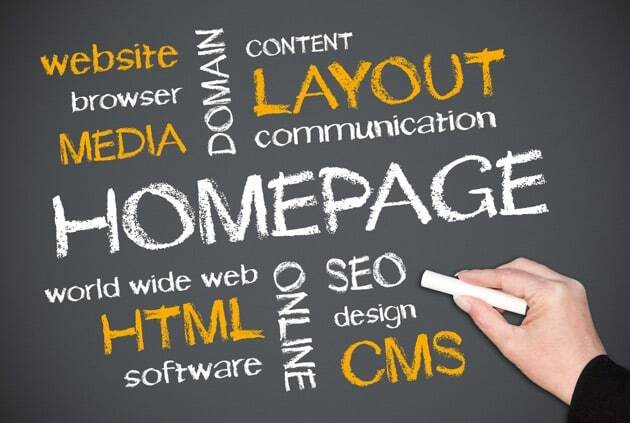 It’s not only a matter of technical SEO, but as we will see below, there are other elements that have to be present in order to have a highly optimized homepage. Don’t forget that SEO is not just for search engines but it’s primarily for users and usability. From an SEO perspective, the optimization of a homepage is no different than doing SEO on other pages of your website. If you want to skip the theory, you can go directly to the homepage SEO Checklist. Besides the SEO factors, you should also take into account other essential elements of a highly optimized homepage. Don’t just use your business or website name as the homepage title but try to be more creative by giving users and search engines more information about your website’s main focus. Utilize all 60 characters you have at your disposal to blend keywords and business information in one sentence. The first one is coming directly from Google and in particular the Google Ads homepage. Notice how they use their target keywords PPC Online Advertising in the page title. Here is another example from MOZ. One of their main keywords, SEO Software is placed right after their business name. Keep the title up to 60 characters. Don’t just use your brand name but include keywords that represent your business or website. Don’t confuse Google by adding too many keywords in the title. Add the keywords that you want to be known for. The homepage description is also very important. As noted above, the description is what users will see in the SERPS, so you may want to give it a bit of thought. Look at the example below from Google AdSense to get some nice ideas. Have in mind that Google may choose not to show your description but use their own. This may happen if your description is too short (i.e. less than 130 characters) or too long i.e. (more than 154 characters), or if it includes a lot of keywords. Read the guide below for step by step instructions on how to optimize your meta descriptions based on data from Google search console. The next thing to optimize is the H1 tag. Each and every page of your website (including the homepage), needs to have one (and only one) H1 tag. The H1 tag is normally at the top of the page and most themes are configured to display the page title enclosed in h1 tags. If you have a choice for setting the H1 tag for the homepage make sure that you also include some related keywords. Open your homepage in the browser, right click anywhere in the page and select VIEW SOURCE. Press CTRL –F (to search for a phrase) and search for “h1”. Normally you should see only one opening <h1> tag and one closing </h1>. If you notice that there are more than one sets active in your html code, then you need to get the help of a developer to remove them and leave only one. A good homepage needs to have images. They make a page less boring and the message that you want to pass to your readers more obvious. In terms of SEO, images can be used to give another signal to the search engine crawlers about your content. When an image includes text, try to separate the image part from the text. Search engines cannot read text that is embedded in a jpg or png. For maximum SEO, keep the image without the text and add the text using CSS and html. Make sure that the image filename has the name of your website. For example, my logo has this filename: ‘reliablesoftnet-logo.png’. The ALT text also includes your website name i.e. ‘Reliablesoft.Net Logo’. Bonus Tip: If you are trying to optimize your homepage for local SEO, you can also include your location (City) in the logo filename and ALT text. 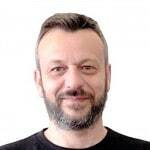 Structured data is gaining importance the last couple of years and although it is not yet part of the Google ranking algorithm, it is something that soon will be included. In simple words, structured data is a way to describe your data to search engine crawlers. All major search engines have agreed to a common structure of presenting the various forms of data (i.e. articles, products, organizations, companies, events etc.) and your job as a webmaster is to add the necessary ‘tags’ to your html code. Google may use structured data in the SERPS (in the form of rich snippets or knowledge graph entries) and this makes your entries more appealing to users and this means higher CTR (click through rates). Person (if you are running a personal blog). A homepage needs to have content, and by this, I mean text content that search engines can read and understand. In case of corporate websites, it will have details about the company, images (a slideshow maybe) and links to the internal pages of the website. In case of ecommerce stores, the homepage may show the latest products, offers, latest news and links to the different product sections. In case of portals or blogs, the homepage typically will display the latest blog posts and featured articles. Regardless of the homepage style you choose; you need to ensure that there is enough text content on the page. Avoid having only images or videos without text. Make sure that your content includes your target keywords or variations. Take a look at my homepage again and notice how keywords, content and internal link blend together. It is a fact that 40% of users will leave a page if it takes more than 3 seconds to load. This means that even if you have the perfect homepage, if it is too slow to load, you will lose visits and customers. #1 – Use a fast server from a reliable host. If you are still on shared hosting, you should definitely consider moving to a VPS. Having your own server plays a big role when it comes to website speed and considering that the cost for a VPS is as low as $25 per month, there is no excuse for serious businesses or bloggers. #2 – Optimize your image file size: Before uploading an image to your website, use a photo editing software (Gimp, Photoshop, Pixelmator etc.) and export the image for the web. Then use an image optimizer like optimizilla to compress and optimize the file size. If you use a lot of images you can also consider using a CDN. #3 – Check your website using pagespeed insights. This is a tool by Google which gives recommendations on what you can do to improve your page speed. 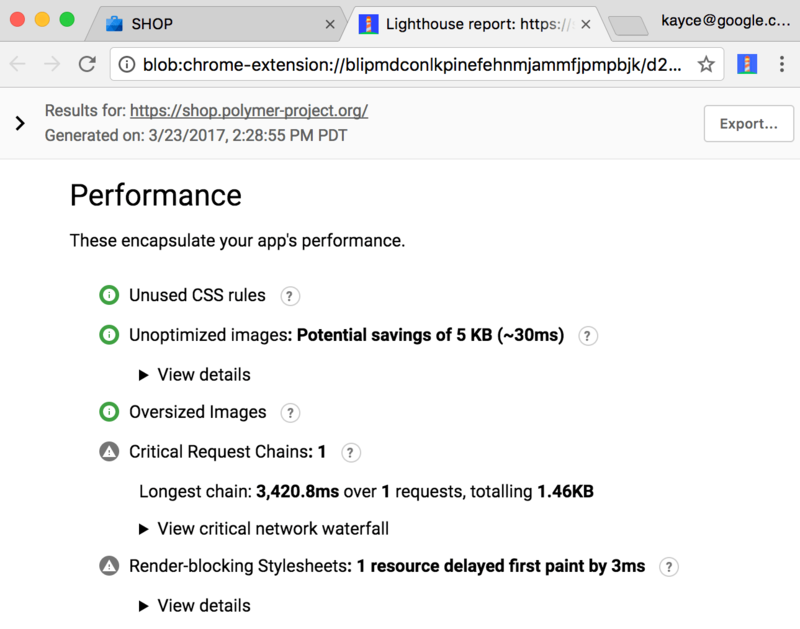 #4 – Use Google Lighthouse. Lighthouse is a tool for analyzing the performance of a webpage in various areas including page speed. #5 – If you use video on the homepage, make sure that this is hosted on a video streaming service like YouTube and embedded to your website. You don’t want to host the video on your website because this will really increase your loading time, bandwidth and required server resources. #6 – Keep your software up-to-date. All CMS platforms are always trying to improve speed and performance so keep your software up-to-date to take advantage of this. More than 50% of searches on Google are now from mobile and it is more than necessary to have a mobile friendly homepage. With the introduction of mobile first index, Google is using a slightly different ranking algorithm for mobile websites but the basic SEO configurations (titles, descriptions, h1, etc.) are the same for both desktop and mobile. When it comes to the homepage SEO, you should run the mobile-friendly test and fix any errors. Also, you need to make sure that your mobile homepage has the same content as your desktop homepage. You don’t want to confuse Google by giving them mixed signals. In general, it is best to use a responsive website design so that any SEO fixes you do for the desktop are immediately available for mobile. A homepage (and website as a whole), needs to be https. If you have an ecommerce store or collect user information this is a must but even in cases where you have a normal blog, it is good to have SSL enabled. Google mentioned many times that for now having an SSL website gives you a small comparative advantage but this is something that will certainly gain more importance in the coming months or years. Navigation is an important usability element. You need to make sure all-important pages of your website are accessed from your menu in no more than 3 clicks. Avoid having nested menu elements that go beyond 3 levels and also consider having the menu ‘always on top’ when the user navigates further down the page. (see how the menu of this website stays on top while you scroll down). A clear menu structure will also aid in reducing your bounce rate and encourage users to visits more than one page from your website. 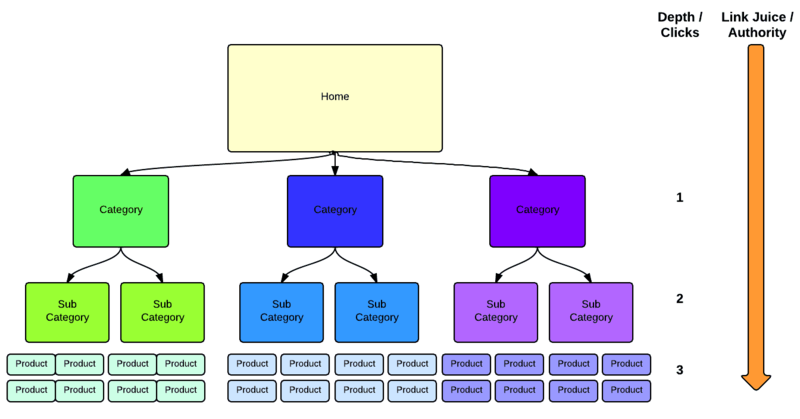 Your website should have a hierarchical structure – The focal point is the homepage and then all other pages should be grouped into categories based on their type. Your hierarchy should be no more than 2 or 3 levels deep – Don’t overcomplicate your site hierarchy but keep it simple. All pages of your website have to accessible from the homepage in less than 3 clicks. Don’t forget that the way search engines work is to visit the homepage of a website and then follow any links to discover the rest of the pages. This means that your homepage should link to ALL important pages, including sales pages and any blog posts you want to promote more than others. A well-structured homepage can get you sitelinks in Google Search. Sitelinks are typically shown for domain name searches. 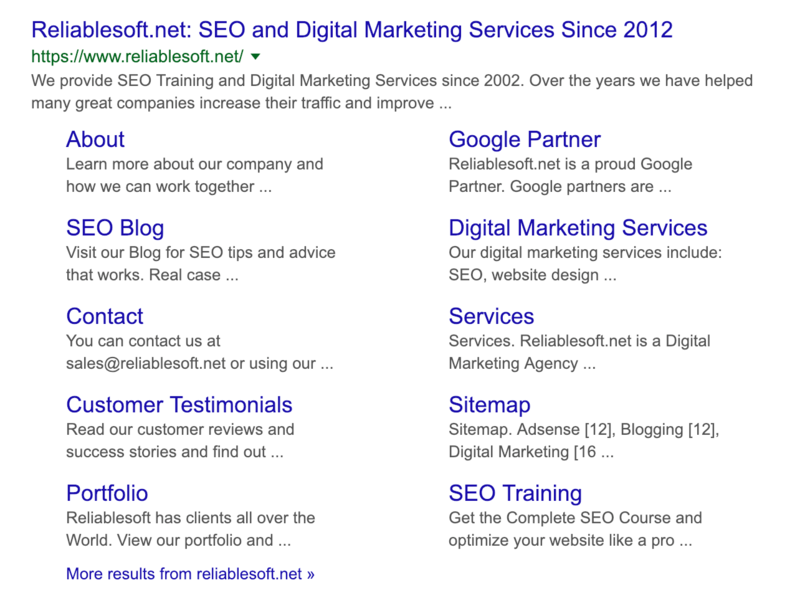 For example, if you search Google for reliablesoft.net, you will see the follow snippet with sitelinks. The only way to influence what appear as a sitelink is through your site structure and navigation. Think about what you want users to see when they search for your business name and adjust your homepage sections accordingly. For any type of website, the homepage needs to have a clear purpose. If you are selling products, then the main purpose will be to re-direct users to your products page, if you are selling services to your services page and in cases of blog to your articles. Have a look at my homepage and notice that the ‘call to action’ is one of the elements the users see when they land on the page. When a user visits your homepage, you have 3 seconds to grab their attention and gain their trust. Things like social proof, customer testimonials, achievements or partnerships, success case studies are all elements that can help towards this direction. Don’t assume that users will navigate your website in detail to find out more about you but make sure that you give them everything they need to know in the homepage. 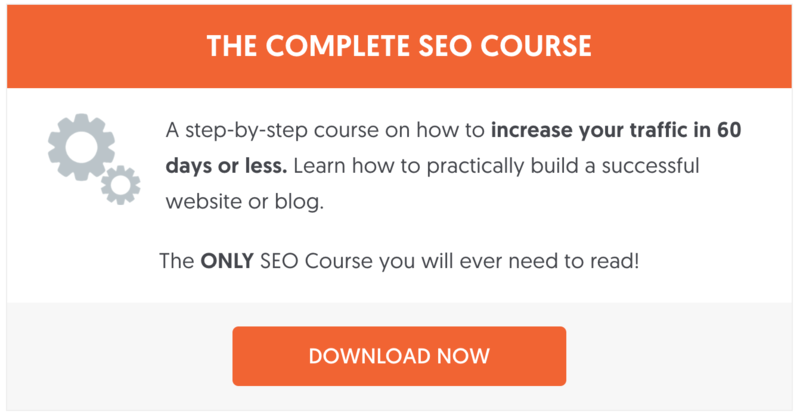 Here is the complete homepage SEO checklist. Make sure that users can access any page in less than 3 clicks starting from your homepage. Review sitelinks shown in Google search and adjust your navigation and homepage structure accordingly. Homepage SEO is important for all kinds of websites. The homepage is the ‘front door’ of your business (or blog) and should have a clear structure, load fast and give users options and details about your website’s purpose. Thanks for the article! may I add internlinking from other pages of the website to the homepage, perhaps this was stated in the article, I am not sure…. Absolutely, adding internal links pointing to your homepage definitely helps. Thanks a lot of commenting. Thanks Mr. Alex…for this awesome instructions for SEO, that what we have to do and what not while doing SEO for the Website…. I run a sports news website/blog and have been reading all about SEO for the last couple of months. My biggest concern is regarding H1, H2 and Alt Tags on the home page. Imagine a homepage like espn or sky sports which has a high number of articles and a huge number of images with alt text on the homepage. In such a situation what should a website owner choose as the H1, H2 and alt tags? Latest Article Title as H1 or All title on the home page? What about h2 and alt tag? Would love to read your thoughts on this? PS: Would have redirected you to my site but unfortunately we are undergoing some major development changes and have taken down the website for the next couple of days. Thanks for the details. Its really helpful.